Remember going to school as a little kid? Specifically, think about that moment in the morning, waiting outside in the cold, barely awake and wondering if you actually did your math homework or just dreamed you did. Now picture seeing the school bus come lumbering down the street to collect you. What's the feeling in your gut? If you're like most American kids, that feeling is likely somewhere between a slow, sinking feeling and a quick kick to the pelvis. But what if that bus looked like a rocket or a giant kitty or a Pikachu or something? Silly, maybe, but I can't imagine a little kid that wouldn't feel at least a bit better about the whole school thing if they had a bus like that. The thing is, kids in Japan do have buses like that. It's worth doing a quick Google search of Japanese school buses. You'll see a fun-filled menagerie of animals (including native Japanese fauna like the Pikachu (Pokemensis Electronia)), aircraft, spaceships, anthropomorphized buses, and all manner of things that aren't plain, boring buses. Having one of those — or even better, a random selection from a pool of those — come get you every morning would turn a somewhat grim daily routine for a little kid into an engaging daily ritual. One's a school bus, which we pack our beloved kids onto, and the other is a prison bus, which we pack our beloved murders and meth-heads onto. You know what the difference is in these two buses? Color. Oh, and some window bars, though I wouldn't be shocked to see those on some school buses as well. So why do Japanese kids get fun school buses and American kids get yellow versions of prison buses? I don't think we in America want our kids not to have fun at school, but I think culturally we don't feel as comfortable with such blatant displays of whimsy. Japanese kids certainly take school as seriously as Americans, and possibly more so, often to unfortunate extremes. So I don't think the idea that the US feels school needs to be taken more seriously is it — I think it's a more general cultural divide. The Japanese have some common concepts that we don't really have in much of the west, the especially relevant one being kawaii. Essentially, kawaii just means "cute" but in Japanese culture, there is a much more un-self conscious love of cute. Cute things pop up everywhere — industrial robots sing little electronic songs, guard rails are in the shape of little animals, sections of Tokyo all have their own little mascots. Enjoying cute things isn't considered necessarily infantilizing or not empowering, so there's less restriction. That means if you can make a school bus cute and fun, why not do it? Sure, there's some extra costs, but the value of keeping kids excited to go to school must make that equation make sense. Without as an agressive cute-stigmatization, you can have a giant cat school bus and not worry that people won't perceive your school as a serious institution of learning. I don't think that would be the case in the US. Also, there's a history in Japan of imbuing objects with, while not exactly something like a soul, some sort of feeling. Concepts like wabi-sabi and wu-wei from Japanese philosophy allow objects to contain a certain ability to hold and express a feeling. It's not exactly saying they're alive or anything, but it does open a society up to accepting the idea of objects as things that can be related with beyond simple physical interactions. These are also the same reasons (I think) why Japan has proven to be so much more willing to accept robots into their culture and identity. 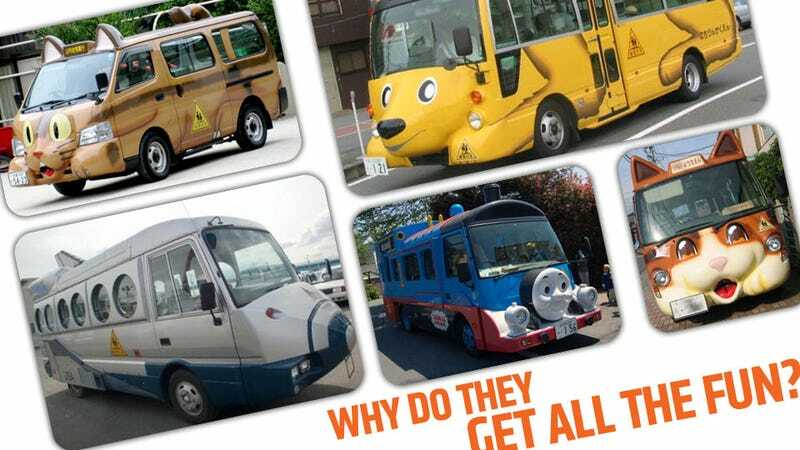 So, why do Japanese kids get so much more fun school buses? Because they let themselves do it. I wouldn't mind seeing a bit of this influence come to the US, so my son can be ferried to school by rocket every morning, and brought home by puppy. That seems pretty good to me.